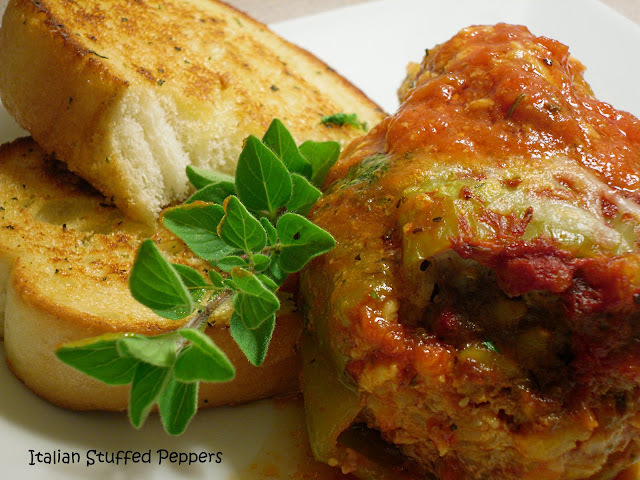 Stuffed peppers are a Polish dish that I grew up with. Bell peppers stuffed with beef and rice and a sauce made with tomato soup (that was my mom's way). This is my Italian version of stuffed peppers using cubanelle or "Italian frying peppers". They have a slight kick to them and are thin walled. Yeah it's like 90 degrees and I'm still baking. Crank up the AC! You might think I'm looney tunes, but while this was baking, I was wishing we all had Smell-O-Blog! After I took the peppers out of the oven and tossed in the garlic bread, I was just looking forward to this. Cook the Arborio rice in a saucepan of boiling salted water until al dente - about 12 minutes. Drain and cool. Preheat oven to 400 degrees F. Prepare the peppers and start the filling; Cut the stems from the peppers and scrape out the seeds and membranes with a teaspoon. Heat 2 Tbsp. of the olive oil in a small skillet over medium heat. Stir in the onion and cook, stirring, until onions start to caramelize. Scrape the onion mixture into a bowl, add the ground beef, grated cheese, parsley, oregano and cooked rice and stir together until evenly blended. Divide the filling among the peppers, using about 1/4 cup to fill each pepper loosely. Rub the outside of the peppers lightly with the remaining tablespoon of olive, placing them in a 13 x 9-inch baking dish as you do so. Roast the peppers, turning once or twice with tongs, until softened and lightly browned in spot, about 20 minutes. Pour in enough of the tomato sauce barely to cover the peppers. Cover the dish with foil and bake until the peppers are tender and the filling is cooked through; 30-40 minutes. In the last ten minutes of cooking time, remove foil and sprinkle with a 4 cheese Italian blend, a sprinkle of oregano and a drizzle of olive oil. Cook until browned and bubbly. Let stand 10 minutes before serving. This recipe is linked up to What's Cooking Wednesday - Turning the Clock Back! Oh heavenly days...does this look good! I have already bookmarked it! This sounds wonderful, pretty similiar to our family except no onion, we use the garlic, and lots of boiled egg... with rice and meat... I am allergic to onions but I will bet these are awesome for the onion lovers out there! I just realized that I have not had stuffed peppers in ages! I love your take on this recipe Patti! wow wowww..this looks soo good! Mouthwatering pictures..I am hungry now just by looking:)) great recipe Patti! I have been wanting to do stuffed peppers for quite some time now and I think you finally just hit the mark with yours! They look incredible and I am loving your recipe! Just stopped by from a comment you left on my friend Alli's blog! You have a great site and I am definitely a new follower! Hello! Just found you on another blog and here I am. I think I can smell that dish! I see you have a Polish background. My husband was born in Poland and loves many of the dishes. Can't wait to explore your blog further. 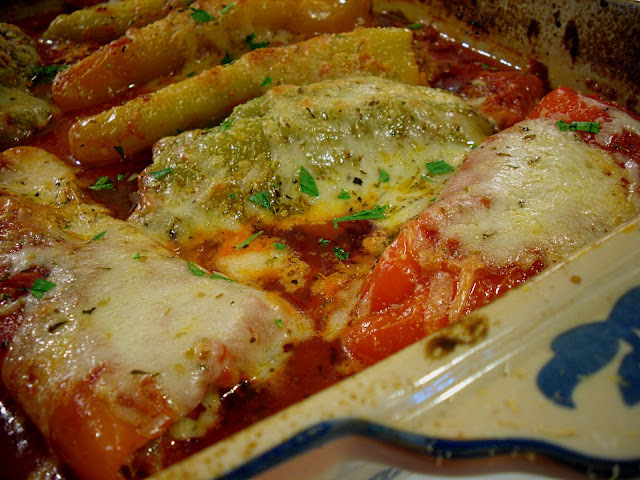 My grandmother always used cubanelles for her stuffed peppers; they were the best.